The formation of tonsil stones is often associated with unpleasant side effects, such as earaches, difficulty swallowing, sore throats, and persistently bad breath. 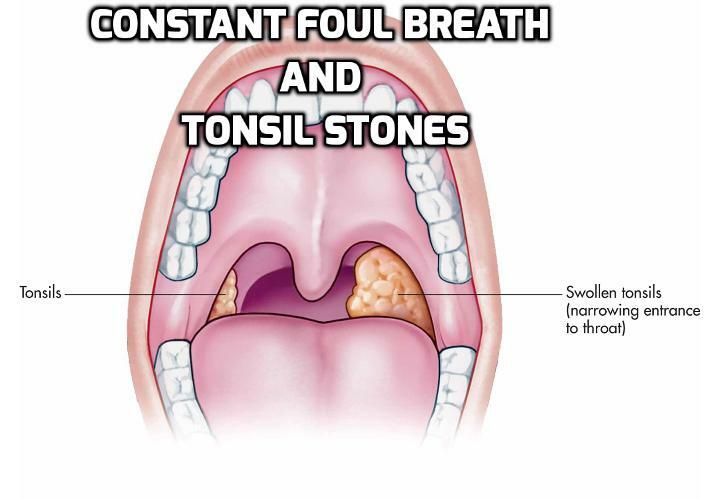 Most people with tonsil stones also suffer from chronic bad breath that is related to their tonsils’ condition, since these small, hardened masses can release an unpleasant, lingering smell if they are not treated. Your tonsils are two small, dimpled organs that are located on either side of the tongue at the back of the throat. These structures function as part of the lymphatic system by making white blood cells and antibodies and by trapping foreign substances that may enter the mouth. The tonsils are made of lymphatic tissue and mucosa, and they also have irregular surfaces in which microorganisms, food particles, dead cells, and mucus can become lodged. If material remains in these crevices (also called the tonsillar crypts) for long, it can decay and harden into calcified tonsil stones. Individuals with large tonsils are more prone to developing tonsil stones than those with smaller tonsils, as the deeper tonsillar crypts make the accumulation of debris more likely. Tonsil stones usually create symptoms like tonsil redness and irritation, and they are often associated with bad breath as a result of the decaying debris they contain. In 2007, researchers at the State University of Campinas in Brazil noted that tonsil stones were present in nearly 75% of all tonsillitis patients with bad breath, but were only seen in six percent of patients with normal breath. As a result, tonsil stones appear to contribute to chronic bad breath in patients with inflamed tonsils. Despite the unpleasant effects of bad breath that they may cause, tonsil stones rarely involve serious medical consequences. For others, however, tonsil stones can be bothersome and irritating because of symptoms like a perpetual sore throat, swollen tonsils, and chronic bad breath. If you are experiencing chronic bad breath and think it could be related to tonsil stones, see your doctor for an examination. He or she may be able to dislodge any obvious tonsil stones in the office and to suggest at-home remedies to reduce your symptoms. If your tonsil stones are large or troublesome, your doctor may suggest you see an ear, nose, and throat specialist for a more-extensive evaluation and for alternative treatment. Previous PostPrevious Which doctors may treat bad breath?